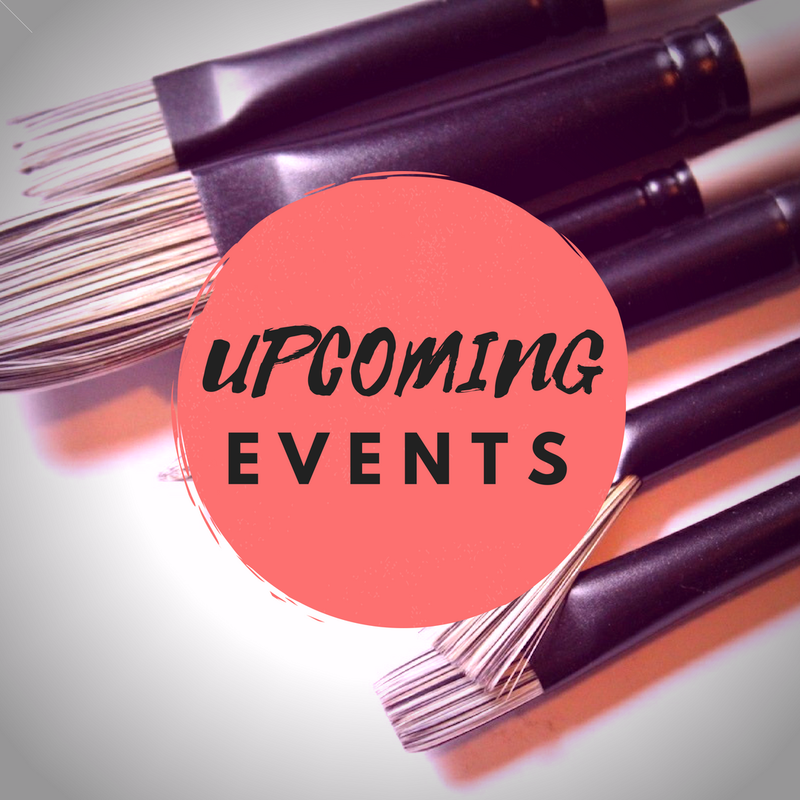 Join Dynasty Brush at these events! Can you believe that 2018 is more than half over?! Do not fret--there is still plenty of time to paint with Dynasty Brush at a variety of conventions, conferences, and trade shows this year! Quickly approaching is the Heart of Ohio Tole (HOOT) conference taking place in Columbus, OH August 7-11, 2018. Click here for more information. Next up is the New England Traditions convention taking place October 2-7, 2018 in Marlborough, MA. Click here for more information. The New York State Art Teachers Association Conference in Buffalo, NY November 16-18, 2018. Open to art educators only. Click here for more information. 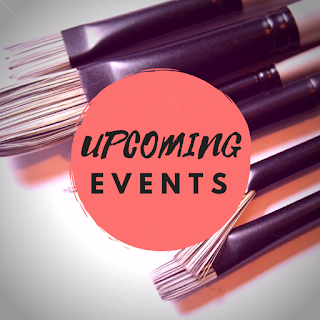 If you are attending one of these events, let us know on the Events tab of our Facebook page. Visit out booth--we'd love to meet you! Check the Events tab on our FB page often as we may be adding more events before the year is over. And as always, if you would like to learn more about our business and our brushes, please visit our website. Greetings, painters and creators! Recently we introduced a special feature for the summer called #howdoyoudynasty in which we highlight artists making magic with Dynasty brushes this season. No canvas? No problem! We want to see the full extent of how our brushes help you reach your artistic best--no matter what surface you are painting. First up in our summer spotlight is Dynasty Artist Sandy McTier of Sandy McTier Designs. 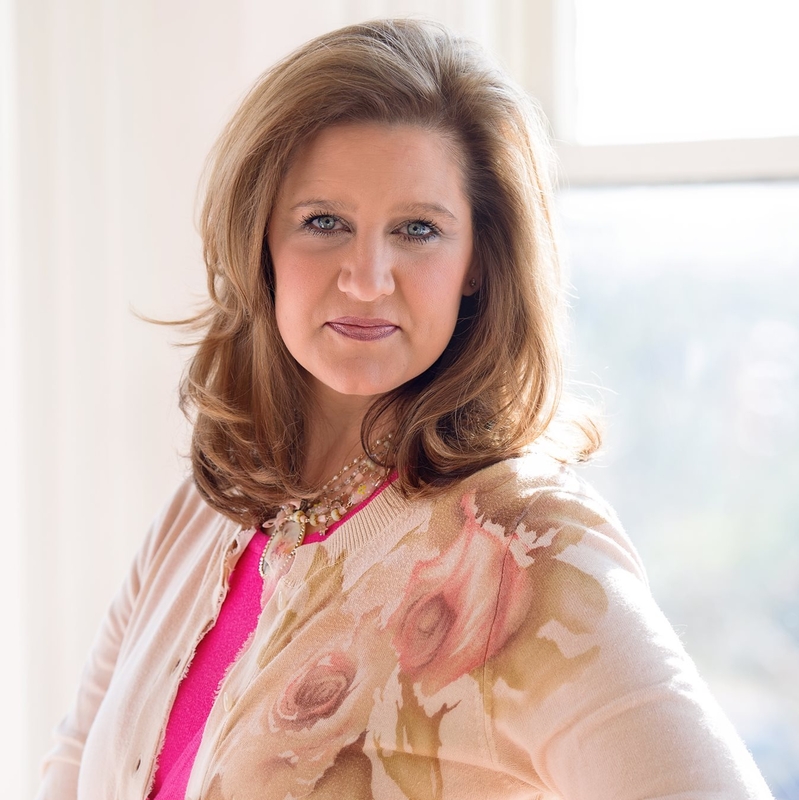 Currently based in Georgia, Sandy is a DecoArt Helping Artist and Chartpak Ambassador, a published designer, and an instructor takes her methods on the road to artists here in the US as well as internationally. In fact, as of this posting, Sandy is busy sharing her skills with the Decorative Artists of Western Nassau on Long Island, NY. Sandy paints on a variety of surfaces--everything from journals to glassware to shoes--making her the perfect candidate for our #howdoyoudynasty summer feature. Today we are talking are talking with Sandy about painting handbags! 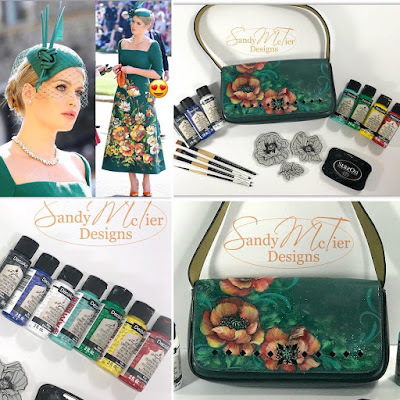 Handbag painted by Sandy McTier, inspired by the dress worn by Lady Spencer at the recent royal wedding. Our questions appear in bold, Sandy's answers follow. All photos used appear courtesy of the artist. What motivated you to go from painting on more traditional surfaces to handbags? "I am always motivated to try new products and brushes to see what they can do! DecoArt recently came out with Stylin paints that can be used on many different surfaces! I love painting on a variety of surfaces and have to admit, I tend to get bored if I stick with one for too long. So, when the new paint was released, I went on the hunt at thrift shops and Goodwill stores to see what I could take from drab to fab!" What sort of prep is involved in painting a purse? Does the material it is made out of matter? "I simply used a damp cloth with a little dish soap on it to clean the purse thoroughly. Rinsed the cloth, wiped it over the purse and then dried it with a soft cloth. As far as the material goes, the paint is made for leather, faux leather, vinyl, canvas, etc. 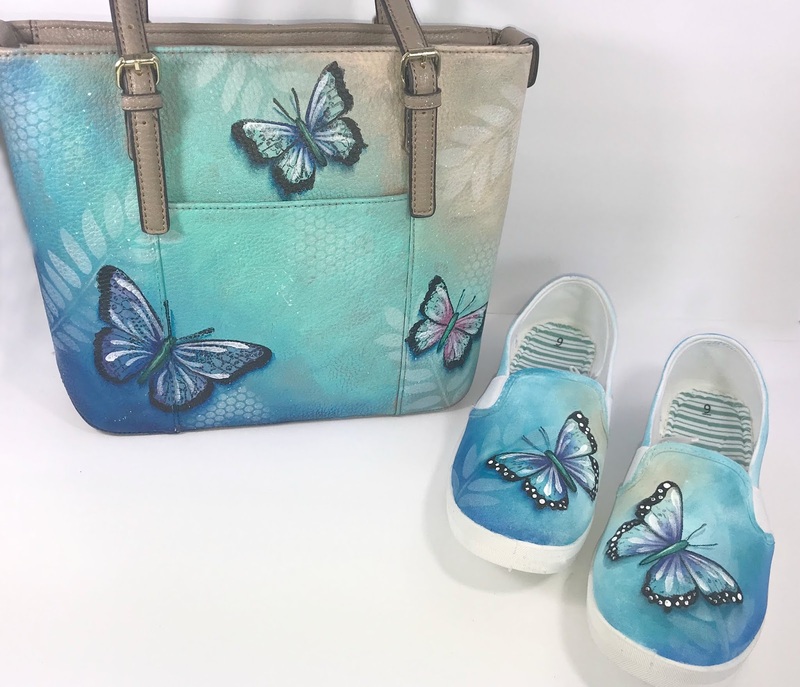 I also recently painted on tennis shoes that were a leather/fabric mix and the paint brushed and covered beautifully on the fabric as well." "The honest answer is--I don't know. I don't have a formula perse from start to finish on how I want to design something. I've been fortunate to have many of my designs and best ideas come to me in my dreams at night. For the most part though, I sit down with a surface, a medium I want to use, and just start creating. I love the intuitive part of creating and tweaking as I go along to get to a final design and product!" "Everything inspires me! Nature, flowers, color, paints and my brushes all inspire me to create! I love taking reference pictures of flowers, buildings, wrought iron, butterflies, birds, and so much more. Many times, I'll sit down to paint a flower and then remember that I took hundreds of photos of that flower. Then I'm able to look through them to see how the petals are formed, how they lay, coloring, etc. However, I've found that if I look through too many pictures, Pinterest, etc. it fills my head with too much and often times keeps me from just creating." What brushes work best for this kind of project? "I love using the Black Gold line by Dynasty. The Flat Washes work great for 'slip-slapping' (a technical term--LOL!) paint over the surface. These brushes are perfect for applying the paint and leaving very few if any brush strokes. Then I switch to my Black Gold Shaders, Angles, Rounds and Liners for the design and details. I also love to use stamps on my purses and the Dynasty IPC Large Foam Sponge painter is perfect for applying paint to the stamp. Adding dots to your design is made easier using the Dynasty Small Detailer Foam." As we can see by Sandy's examples, with the right tools and a little imagination, an artist can turn the ordinary into something extraordinary! Be sure to catch her classes if she comes to a convention or workshop near you! If you would like to participate in the #howdoyoudynasty series, let us know! Comment here, message us on Facebook, or post your work to social media with the hashtag #howdoyoudynasty to get in touch! And, as always, to learn more about our vast array of fine artist brushes, please visit our website.